hmm... creamy alfredo sauce in place of tomato sauce would be cool. and maybe three cheese sauce, pesto, etc. I really liked this game. Overall it was really good. I didn't play for a while but it was nice. I like this game. It has way more ingredients, upgrades, being able to customize lobby, it's great. I was in Rank 26 on my iPod Touch, until I got my iPad and deleted data from my iPod. I've been slowly catching up now on my iPhone to Rank 22. Papa’s Pizzeria To Go! Coming Soon! We have some great news for you today! The game that started it all, Papa’s Pizzeria, will be opening up shop for iPhones, iPods, and Android Phones this holiday season! We have been dreaming of the day that we could venture back to Tastyville and cook up some more mouth-watering pizzas. Even though this is a mobile version, you can bet it will be leaps and bounds better than the original classic! Stay tuned for more information on Papa’s Pizzeria To Go! Sneak Peek: Meet the New Girl! Things were simpler back when the original Papa’s Pizzeria came out. There wasn’t a choice between workers when you started the game, it was only Roy, and he was not pleased. But once Papa’s Burgeria came out, we gave players the option to choose either a boy or a girl worker, both of whom were customers from the previous game. Well with Papa’s Pizzeria To Go, we have broken that time-honored tradition by introducing a brand-NEW character from the Flipverse to be the female chef. Let us introduce you to Delivery Girl …. Joy! Sneak Peek: Custom Lobby To Go! Can you believe that the original Papa’s Pizzeria was the only Gameria to not have any furniture?!? Papa’s Burgeria introduced furniture you could buy, and later, Papa’s Freezeria introduced the ability to fully customize your lobby. The “To Go” games run on an engine we developed that is highly optimized for playing on small, less powerful, phones. Needless to say, it’s always an undertaking when we try to add even more capabilities to that engine. Fortunately, we were able to make a major improvement to the To Go series with the all new Custom Lobby Editor! With Burgeria and Freezeria To Go, many people commented on how quickly they were running out of things to buy in the shop. Those games had furniture you could buy, but no way to rearrange the furniture and swap it out with something new. This left the player with a very small amount of decorations they could buy that would fit into the simple lobby. Our goal was to create a lobby editor on par with the HD and web versions of our games. However, it also needed to perform well on phones, and be usable on a tiny screen. We first needed to overhaul the shop to include categories and a new swipe control system. Once we had a robust store with lots of decorations, we needed a lobby editor that would work well on a small phone. Now you will be able to style your lobby with a wide variety of furniture and posters that will surely please your customers. 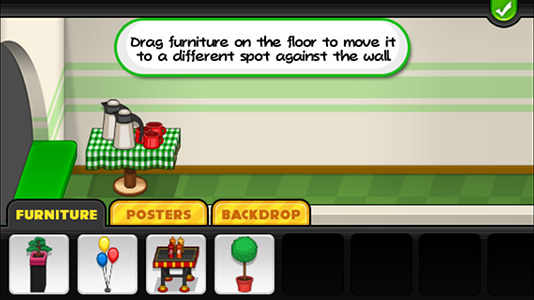 We also included Backdrop bundles that change the wallpaper, floors, trim, and counter top! So now, you can get all the lobby customization of the HD games on the go in Papa’s Pizzeria To Go! For this weeks sneak peek, we wanted to show off the all new, streamlined Topping Station in Papa’s Pizzeria To Go! 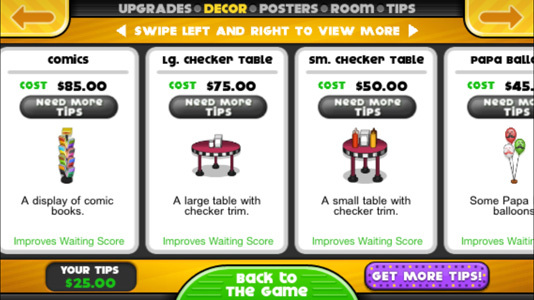 For this game, we’ve completely redesigned the Topping Station for smaller screens. 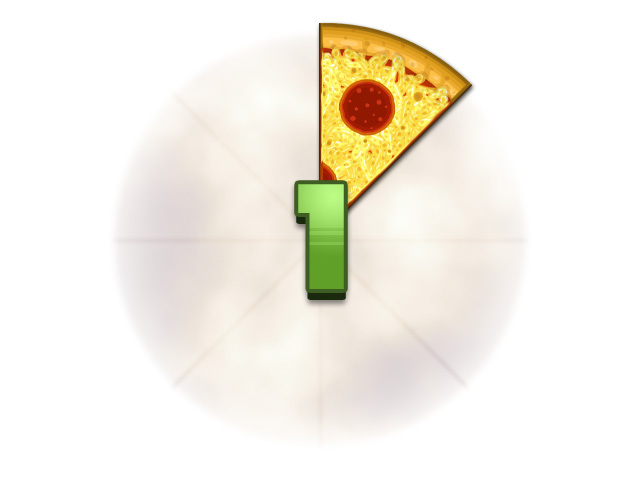 Bins of toppings can be scrolled around the pizza with your thumb, which allows us to have many more toppings than in the original game. We’ve also done away with dragging each individual topping onto the pizza. Now, simply tap on a bin to select that topping, then tap multiple times on the pizza to add items directly onto the pizza. For those extra talented chefs, you can even drop multiple toppings at once by using more fingers. This cuts down on time spent making massive supreme pizzas for some of your extra hungry customers. When you’ve finished topping your pizza, a quick swipe on the pizza will send it off the to the Bake Station. Sneak Peek: The Bake Station! For this week’s sneak peek, we’re moving on to the all new Bake Station in Papa’s Pizzeria To Go! The Bake Station is fully redesigned from the ground up to incorporate more stuff, and streamline the experience. After the Topping Station, your pizza will be waiting for you in the Bake Station. You will be able to then drag your pizza onto Papa’s famous coal-fired pizza oven. Unlike the original, you will have access to upgrades like alarms and oven boosters. Customers can have their pizzas cook half-baked, regular, or extra crispy, and you can get alarms for all three of those. If your customers are getting impatient, you can grab some boosters to cook those pizzas up extra fast. Once the pizza is finished cooking, simply drag it over to the green tray to send it over to the next station. Sneak Peek: The Cut Station! For this week’s sneak peek, we’re showing off the last station in Papa’s Pizzeria To Go, the Cut Station! After a pizza is baked to perfection, you’ll take it over to the Cut Station to make some slices. 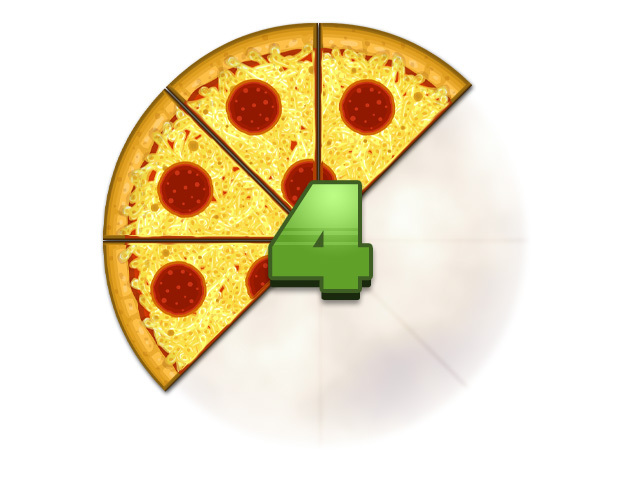 Depending on the customer, there are four possible ways they will want their pizzas cut. We are introducing upgrades to this station in the form of cutting guides that you can get from the shop. Simply click on the Blue guide button on the left to switch between the guides you own. 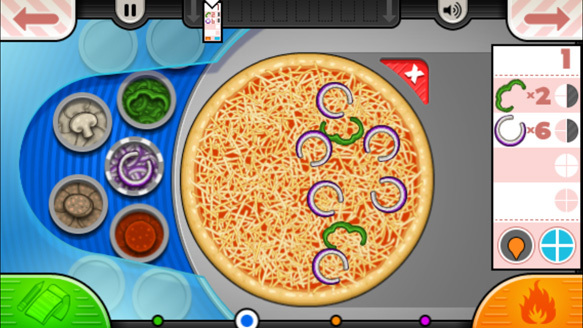 To cut a pizza in the original game, you had to drag the mouse across the pizza and release. 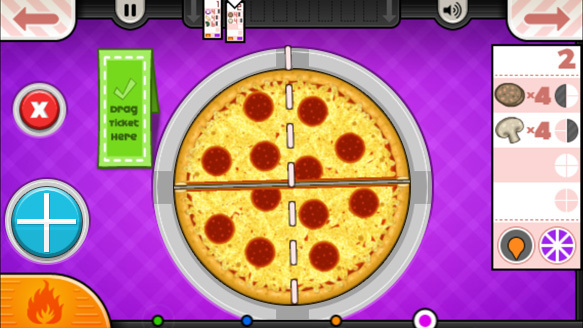 In this game, you have two ways you can slice your pizza. First is the traditional finger swipe across the pizza to cut it. The second incorporates the use of two fingers to precisely aim the dotted cut line. Whichever way you slice it, cutting in Papa’s Pizzeria To Go is a breeze! We have a confirmed launch date for Papa’s Pizzeria To Go! The game will be available for download on iPhone, iPod Touch, and Android phones Thursday, November 13th, 2014! That’s only 8 days away!!! 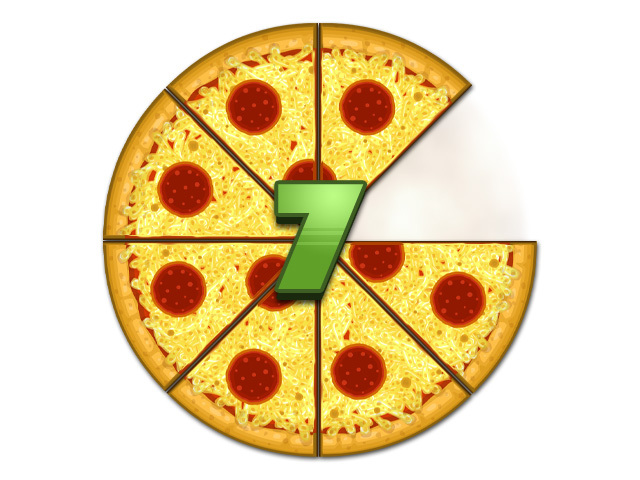 Papa’s Pizzeria To Go: 7 Days Away! 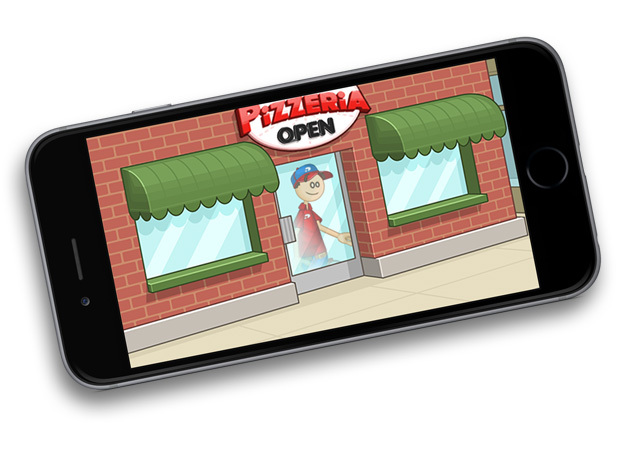 Papa’s Pizzeria To Go will be available for download on iPhone, iPod Touch, and Android phones Thursday, November 13th, 2014! That’s only 7 days away!!! 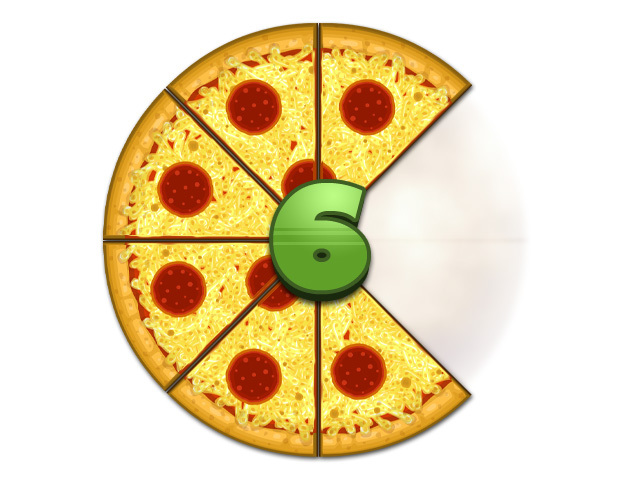 Papa’s Pizzeria To Go: 6 Days Away! 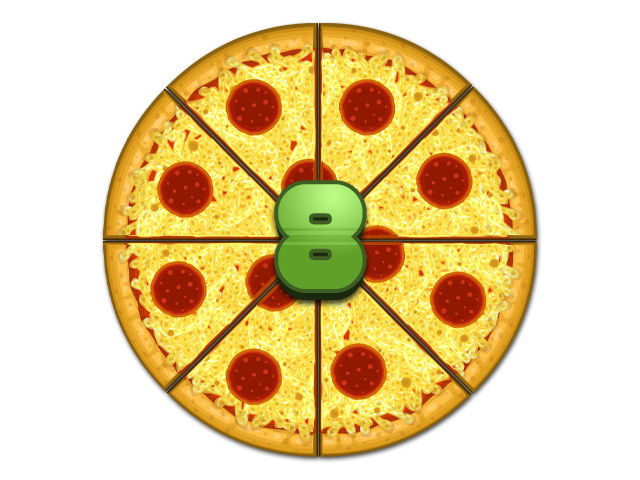 Papa’s Pizzeria To Go will be available for download on iPhone, iPod Touch, and Android phones Thursday, November 13th, 2014! That’s only 6 days away!!! 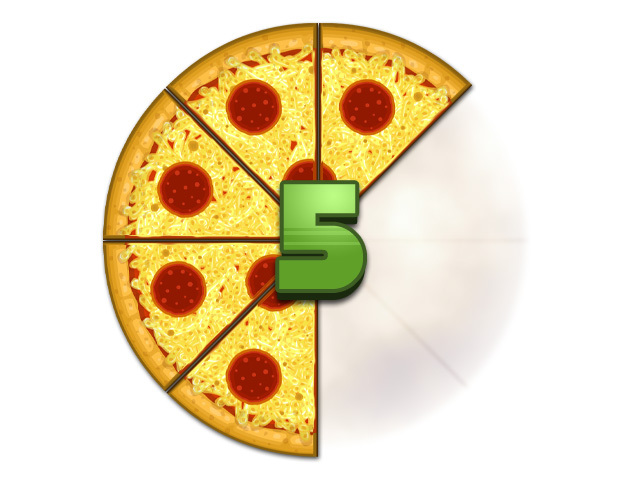 Papa’s Pizzeria To Go: 5 Days Away! 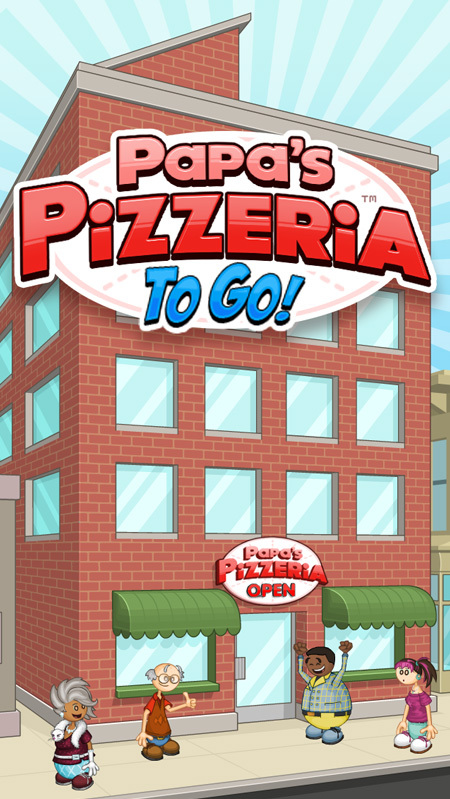 Papa’s Pizzeria To Go will be available for download on iPhone, iPod Touch, and Android phones Thursday, November 13th, 2014! That’s only 5 days away!!! Papa’s Pizzeria To Go: 4 Days Away! Papa’s Pizzeria To Go will be available for download on iPhone, iPod Touch, and Android phones Thursday, November 13th, 2014! That’s only 4 days away!!! 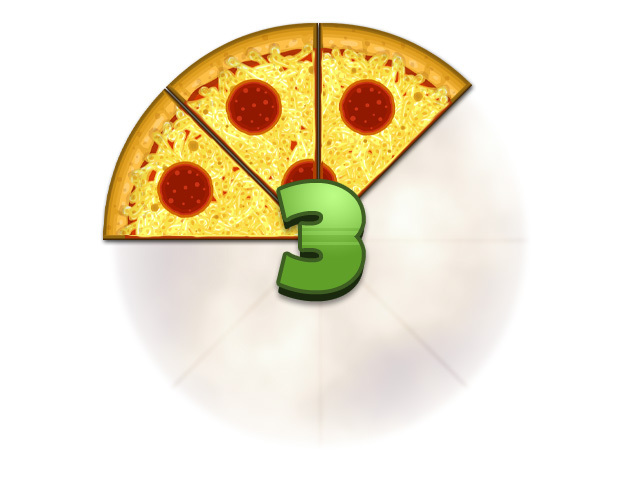 Papa’s Pizzeria To Go: 3 Days Away! 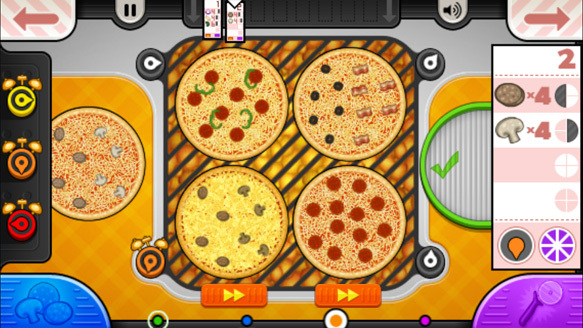 Papa’s Pizzeria To Go will be available for download on iPhone, iPod Touch, and Android phones Thursday, November 13th, 2014! That’s only 3 days away!!! 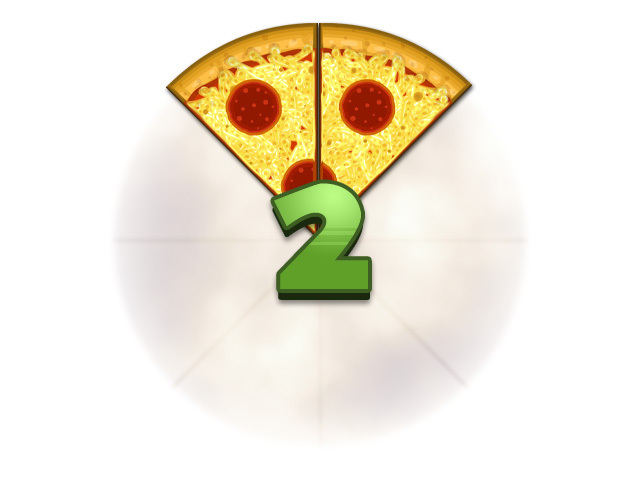 Papa’s Pizzeria To Go: 2 Days Away! 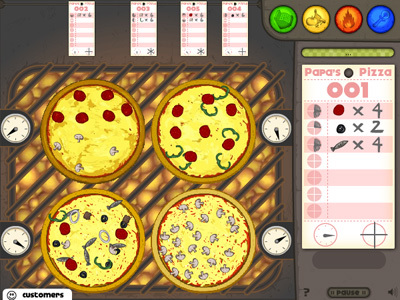 Papa’s Pizzeria To Go will be available for download on iPhone, iPod Touch, and Android phones Thursday, November 13th, 2014! That’s only 2 days away!!! Papa’s Pizzeria To Go: 1 Day Away! Papa’s Pizzeria To Go will be available for download on iPhone, iPod Touch, and Android phones tomorrow, November 13th, 2014! That’s only 1 day away!!! Probably the most forgotten to go game.